What ever happened to my 20/20 vision? Now I need to depend on dollar store cheater glasses. I buy them by the dozen. You know it's getting bad when you are in the shower and things start getting blurry. When you finally figure out that it is because you left your cheater glasses on your eyes dingy and they are steaming up!!! 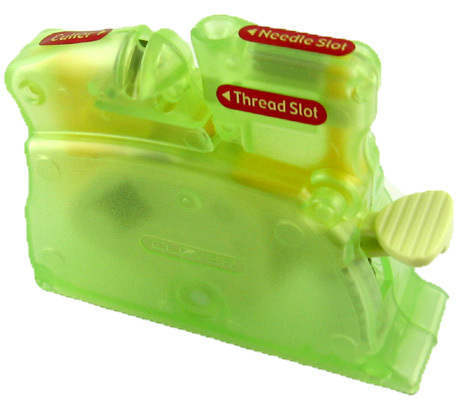 But, I have found a great eye saver when I'm trying to thread hand needles to sew on my binding or buttons. I used to get so frustrated in trying to thread the needle. I've tried the cheater needles but I end up pulling the thread out of the cheater part a lot. So here it is... The Clover Desk Needle Threader. I've seen it have mixed reviews different places but I really like mine. P.s. my official eye appt is on Friday.